Beginning in 2014, we conducted a 1,740-person nationwide survey in Ecuador with the aim of understanding why some respondents prioritize environmental protection while others do not. In Comparative Politics and Global Environmental Politics last month, we published separate analyses of the results. In the first article, we found that Ecuador’s indigenous people in the southern Amazon region feel more strongly about environmental protection than those in the country’s northern Amazon region. This may be partly explained by their proximity to oil drilling and a grueling history of resistance and setbacks. Indigenous groups in the north live on the nation’s extractive frontier. In 2013, oil spills and resulting public health risks in the area prompted communities to pursue a landmark legal case against Chevron (formerly Texaco). And there’s the saga of the Yasuní-ITT Initiative. In the south, rainforests are still largely pristine. “Where the environment is destroyed, our identity is destroyed, as this interrupts the relationship between nature and our people,” said Romulo Akachu, vice president of Ecuador’s national indigenous federation, called CONAIE, and representative of the Shuar Nation, where there is currently no oil drilling. These findings imply that mobilizations for popular support of environmental protections may have better success before widespread degradation and contamination from oil drilling. 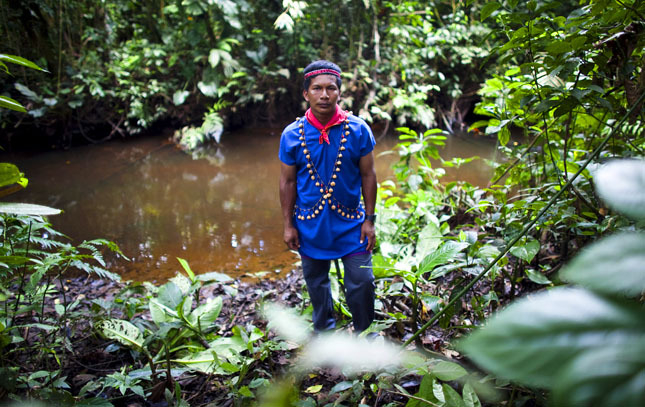 In 2009, following a fight over the fate of oil reserves in Yasuní National Park led by native groups in the area, the Ecuadorian government pledged to “leave the oil in the soil” – on one condition. The government asked international donors to pay the forgone oil proceeds, in effect financing the park’s preservation and more. More than $300 million was pledged by Italy, Germany, and other governments and wealthy individuals as the effort was hailed as an innovative means to protect fragile areas and indigenous rights. But in 2013 President Rafael Correa announced that not enough money could actually be collected from donors and that drilling would go forward. A concession was granted to a Chinese company, which extracted its first crude in 2016, ending Ecuador’s symbolic importance in the worldwide “stranded oil” movement. The Ecuadorian government has, over the last couple of years, discredited anti-oil indigenous national assemblies, including those of the Achuar and Zapara peoples, naming “parallel” assemblies managed by pro-government leaders who favor extraction. Activists also report that national programs like Socio Bosque (“Forest Partner”), conceived to preserve wilderness by paying nearby residents not to plant crops or sell lumber, have been distributed only to families that support extraction. The spiritual framework in which many indigenous people view environmental problems also colors opinions. In Ecuador, the concept of Sumak Kawsay (in Kichwa) or Buen Vivir (Spanish), describes the Andean cosmovision, which ascribes a living essence to nature and sees humanity as part of its ebb and flow rather than a subject outside it. Taking this further than any other nation, the Ecuadorian constitution in 2008 granted nature “human” rights, and designated any citizen as qualified to defend these rights. As documented by Kauffman and Martin, the rights of nature have been invoked in more than a dozen lawsuits, with nature winning many, but losing several high profile cases. The Kichwa cosmovison contributes to indigenous support for efforts to combat climate change, acting as a compliment to Western scientific arguments, we found in our second analysis, in Global Environmental Politics. But when the sacred link between humans and nature is broken, believers in this Andean cosmovision may lose interest in saving the environment because their lands go from being spiritual and sacrosanct to just another economic resource. CONAIE National President Jorge Herrera, a Kichwa resident from Ecuador’s central mountains, said the Ecuadorian government’s clientelist manipulation – giving resources to some while depriving them from others – focused residents’ interests on materialism and away from the Buen Vivir sacred bond. Other indigenous activists interviewed argued that concern for the environment had not diminished in polluted, post-extraction areas. Rather, the survey had picked up their demoralized attitudes concerning public health risks, economic hardship, and migration. These results argue two points. First, that proximity and perceived vulnerability to the negative effects of oil extraction are more significant correlates of strong pro-environment attitudes than indigenous identity in and of itself. Second, that policy reforms to prevent environmental degradation should perhaps focus more on self-interest than appealing to a preconceived set of values. Each respondent’s sense of vulnerability to the negative impacts of oil extraction affected their attitude toward the environment more than their self-defined ethnicity. We also found that belief in the Kichwa indigenous cosmovision gave survey respondents a much higher propensity for making environmentalism a priority. A new president will be elected next month in Ecuador, and it remains to be seen whether the nation’s agenda of populist social spending through oil royalties will continue. Correa – part of the “pink tide” of extraction-propelled leftist leaders in Latin America which included Venezuela’s Hugo Chavez and Bolivia’s Evo Morales – has fallen on hard times over the last couple of years. Under his leadership, Ecuador expelled international lenders like the World Bank and instead cut deals to gain immediate liquidity by selling oil futures at cut rate prices to China. When the price of oil was high this was a manageable policy, but as oil prices have dropped dramatically over the last year, its flaws have grown increasingly apparent as the bills come due. CONAIE activists, meanwhile, say they plan to appeal to new international legal instruments and courts to ensure greater say in efforts to extract oil and minerals like copper from their lands. They point to the 2012 Inter-American Court of Human Rights ruling on Sarayaku v. Ecuador, first brought in 1992, in which the Sarayaku people were awarded more than $1 million in oil-related damages and their rights to free, prior, and informed consent were reaffirmed, as a key victory in bringing more attention to the procedural rights of indigenous peoples. Karleen West is an assistant professor of political science at SUNY-Geneseo. Sources: Comparative Politics, Global Environmental Politics, The Guardian, Inter-American Court of Human Rights, Journal of Comparative Politics, World Development. Photo Credit: A member of the Cofán Dureno indigenous community of northern Ecuador, April 2010, courtesy of Caroline Bennett/Rainforest Action Network. This was a good site for me, thank you.